If there's one thing an Arcadia Group Fashion Gift Card offers it's flexibility. Accepted in seven top-name high street stores, it doesn't matter what kind of fashion you're into, we've got clothes, shoes and accessories that will take you straight to the top of the A-list. This gift card opens the door to a whole world of fashion. And that's not all. Footwear, accessories, jewellery, workwear - whatever you want to wear, you can get the perfect look from Arcadia. It's also the ideal reward and incentive to offer staff. After all, who wouldn't want a gift card you could use in Burton, Dorothy Perkins, Evans, Miss Selfridge, Topman, Topshop or Wallis? The gift card can be topped up with any amount from £1 to £300 and it's the ideal way to please all of your staff, all of the time. Accepted in 2,500 stores in the UK and Ireland - and with 2 well-known male brands and 5 female-focused brands - this is your chance to try out one of these flexible cards for yourself. All you need to do is answer one easy question (as below) and submit your reply no later than 5pm on 10 July 2011 and the £30 gift card could be yours. 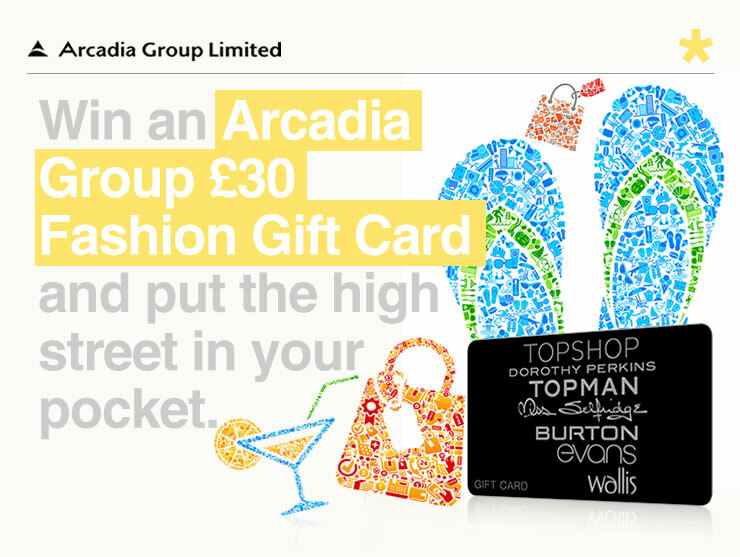 For general enquiries about the Arcadia Group Fashion Gift Card, please click here. 1. How many well-known male brands does the Arcadia Group own? Our gift card can be redeemed in any one of our 2,500 stores in the UK and Ireland.